The 2019 rally continued as a week of better-than-expected earnings which showed corporate profits continued higher despite the present global growth headwinds. Optimism over what has been so far an “upbeat” earnings season drove stocks higher, allowing investors to look beyond the divisions in Washington and concerns over the slowing world economy. We also had a series of management conference calls, where company executives expressed optimism for their businesses in the coming year. Stocks were also boosted by expectations that the Federal Reserve will take a much more dovish stance in 2019 than previously thought, with The Wall Street Journal reporting that Fed officials are close to a decision on whether to end the shrinking of the central bank’s balance sheet early. However, a deal reached by President Trump and Democrats to at least temporarily reopen the government seemed to have little impact on stocks. After a string of four solid up weeks, the Jones added just +0.12% this past week. 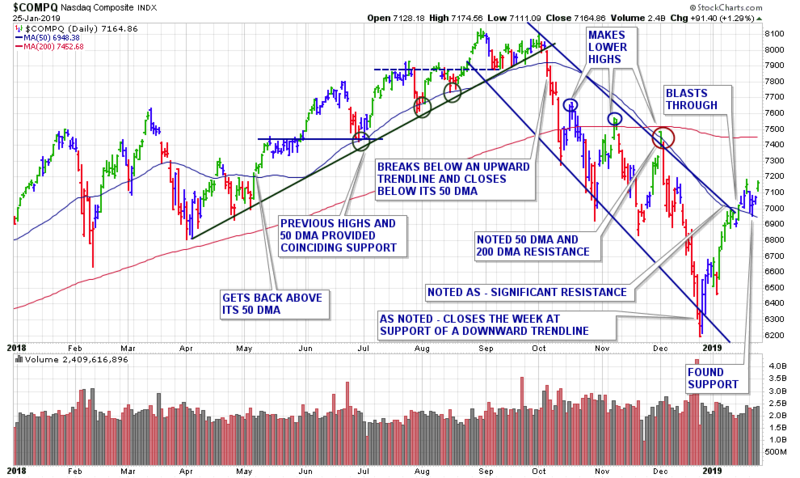 The index has continued to plow through noted areas of resistance. 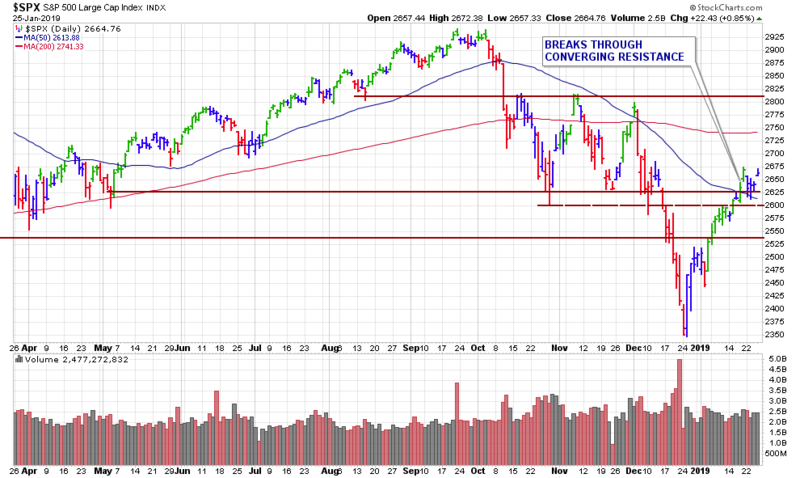 As of Friday’s close, the blue-chips are now facing their next hurdle which is resistance of a downward trendline and the coinciding 200-day moving average. The Nasdaq gained +0.11% this past week, eking out a fifth weekly gain. Meanwhile, the S&P 500 actually closed the week down -0.22%, yet remains well above initial support. 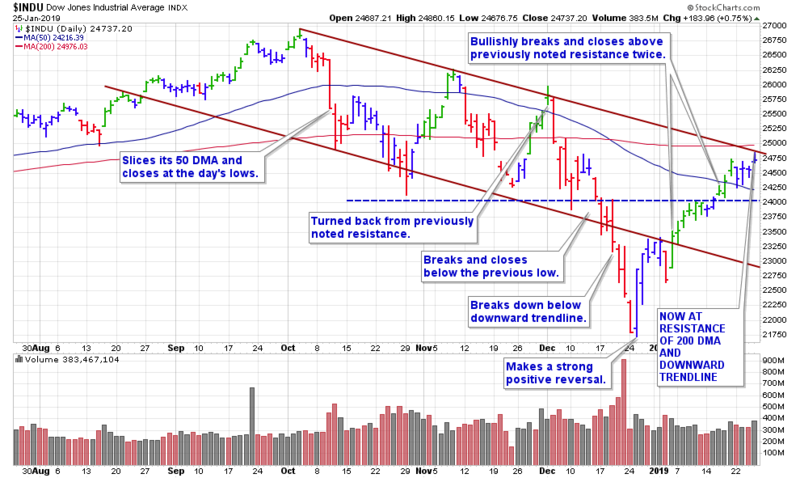 As reported last week, the 3 major indices remain below their 200-day moving averages. Currently, the market continues in a confirmed uptrend, with only 2 distribution days on the S&P 500 and just one on the Nasdaq. This week, Wall Street investors will turn their attention toward Silicon Valley. Four of the five most valuable technology companies in the world — Apple (AAPL), Amazon (AMZN), Microsoft (MSFT) and Facebook (FB) — are all set to report earnings. I ran my routine stock screens and added several stocks to our watch lists. We now have a total of 21 stocks which we will be watching for a potential breakout.